Lawang Sewu is a building in Semarang, Central Java which is office from Nederlandsch Indishe Spoorweg Naatschappij or NIS. Built in the year 1903 and having in the year 1907. 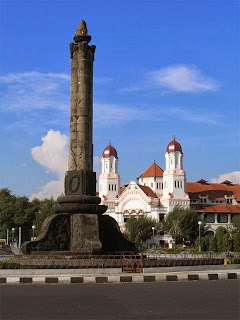 Located in complex Tugu Muda Semarang which ahead is called as Wilhelmina Plein. Lawang Sewu is built in the year 1908, what done by Professor Dutch architect Klinkkaner and Quendaag. The year 1920, this building starts used as head office Nederlandsch Indische Spoor-weg Maatschapij (NIS), a firm or first train company in Indonesia standing the year 1864. When happened Pertempuran Lima Hari in Semarang, 14-18 Augusts 1945, Lawang Sewu and its surroundings becomes center encounter between Indonesia combatants and Japan army. Many victims which dies that moment. To commemorate them, on the left entrance (spandrel) build a cenotaph to write down name of the Indonesia combatants that is killed. But, from the side of Japan do not be permitted builds monument or monument of similar. Local public calls it Lawang Sewu (a Thousand Doors). This because of the building has door which a lot (in reality door of the do not a thousand, possibly also because this building window height and wide, public also assumes it as door). This two floors luxury and ancient building after independence used as Indonesia Railroads office ( DKARI) or now PT Indonesia Train. Besides have ever been used as Kantor Badan Prasarana Komando Daerah Militer (Kodam IV/Diponegoro) and Kantor Wilayah Departemen Perhubungan of Central Java. During struggle of this building has note of separate history that is when taking place event of Pertempuran Lima Hari in Semarang (14 Octobers - 19 Octobers 1945) in this stripper building becomes location of super encounter between young mens AMKA or Angkatan Muda Kereta Api fights against Kempetai and Kidobutai, Jepang. Hence from that is the Government of Town Semarang with SK Wali Kota 650/50/1992, input Lawang Sewu as one of 102 historic or ancient buildings in Kota Semarang which properly is protected. Now building having age the empty 100 years and having reputation as dreadful building. Once in a while applied as place of exhibition, between of Semarang Expo and Tourism Expo. In there are also discourse which wish to change it becomes hotel. In the year 2007, this building also used for film with the same title with its(the building.